Oscar has had quite the place in the family tree. 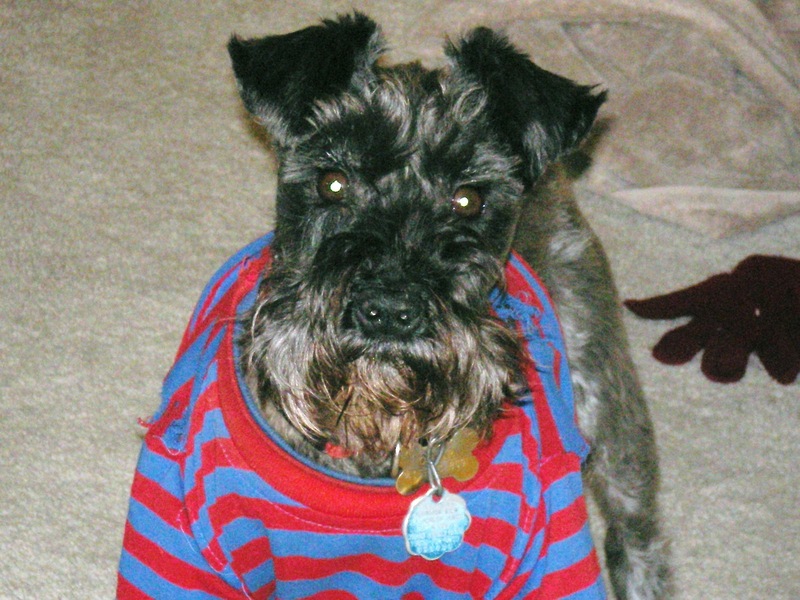 Oscar Dog is a Miniature Schnauzer that we got for the kids in September 2000. He is a well loved, perpetual three year old. Now the kids are gone, I still have the dog. My advice to parents is if the reason you are getting a pet is for the children, get the pet while they are young. The children grow up, leave home for missions, school, and marriage. Then you, as the parent have the privilege of retiring with the dog. Oscar hates the rain, we got him a raincoat once, but returned it. He looked so funny in it, as it kept slipping over his head so he couldn't see, it was quite hilarious. While he hates the rain and baths, he loves to play in the snow. He doesn't like the dark, he loves carrots, strawberries and cheese and any kind of hotdog, He isn't canine or kitty friendly at all, and we keep him under close tabs for those reasons alone. He has personality-plus, is the perfectly spoiled pup. He loves to go on field trips and doesn't care whether we go for a walk or in the car, he loves to go anywhere. He has quite the history for getting himself into trouble, which makes for great conversation anytime, so I thought it would be fun to give him his own page of adventures. . . .
Oscar was in his favorite spot when we are cooking in the kitchen, on guard to "clean up" any thing that lands on the floor. The Genius reached over me to get the whipping cream out of the sack that I brought it home from work in. The container of cream had begun to separate from it's whipped state into layers of solid vs. liquid state, with the thickened portion at the top. As he poured it on his cobbler it flooded his plate.
. . . and the floor got mopped. To be perfectly honest, I'm not quite sure what our dog sees in toilet paper, but obviously it must be good. The Genius got me a trash can with a lid for mothers day, so Oscar couldn't get into it, then just this week he attacked the entire roll, this is a new thing for him. We are very aware that we have a goofy dog. In our experience, we only find it possible to sort of roll our eyes in amusement and clean up after Oscar Dog. It's going to be fun to update this page of our Oscar. Maybe I should try eating TP some day, who knows, I might be missing out on something incredible. . . on second thought, I think I'll pass, but thank you anyway. Oscar dog likes to play in the leaves. We hide his toy in the middle of the pile and he makes a big mess trying to find it. It's really fun to play with Oscar. I honestly don't know what my family thinks sometimes. I look ridiculous! But for Christmas we did this pajama thing so they made me pajamas too! Oh, my, at least it's only once a year I have to do stuff like this, and to be honest, they looked fairly pathetic too., so I wasn't alone. I have to admit, it was fun to see us all dressed up in sleepers. Checking out "facebook" with the genius. Much more interesting than writing code, I just go to bed when that activity begins. . . z z z z z z z z z z z z z z z z z z . . . . . .